The monarch butterfly is known for its amazing annual spring and fall migration – from wintering grounds in Mexico in the spring northward across North America then reversing in fall and returning to Mexico, a trip of more than 2,000 miles (one way) for many of these hardy bugs. This migration is a biological mystery. Most adult butterflies live about a month or so. Their primary function is to propagate the species. It has often been said that a butterfly is just the breeding stage of a caterpillar. But the last emerging monarch of the summer doesn’t fit this mold. It is not sexually mature when it leaves the chrysalis. Instead, it turns south and heads for Mexico. It will not sexually mature for six to eight months, when it leaves Mexico in the spring and heads back to North America where it will emerge from reproductive diapause and begin the common cycle of breeding, egg-laying and then the adult will go to that happy butterfly garden in the sky, while the egg hatches, the caterpillar grows, then pupates and the chrysalis opens to reveal another generation of monarch butterfly. The other part of the migration mystery is maybe, even more, intriguing. The animal that eventually turns south, towards Mexico, is as many as four (or more) generations removed from the animal that left Mexico in the spring. How this creatures finds its way back to the same area in the mountains of central Mexico every fall is a wonder. The monarch population took a big hit just a few years ago. The 2013 winter population in Mexico was estimated at about 33 million, the lowest number ever recorded. There is no way to be sure about what caused this precipitous decline but scientists believe the major culprits were habitat loss and/or degradation and the widespread use of herbicides and pesticides. This winter, things are looking up. 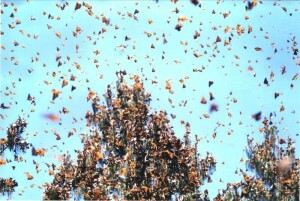 Overwintering monarchs in Mexico covered about 10 acres of forest. The number was estimated to be about 140 million butterflies tripling last year’s numbers. Scientists are pleased with the uptick and are cautiously optimistic that a monarch recovery may be underway. But there is still a ways to go. A summit held in 2014 set a target of 15 acres (6 hectares) of overwintering monarchs by 2020. While scientists think this would provide a stable population of monarchs it is only a third of the area covered in orange and black back in 1996 – 1997. One simple thing that everyone/anyone can do to help monarchs is plant milkweed. It doesn’t take a stand of acres and acres – add a few plants to your wildflower garden or backyard habitat – it really makes a difference, as milkweed is the primary host plant of the monarch. Planting different species of milkweed that mature at different times helps ensure there will be available plants when monarchs need them. There are other ways to help the monarch too – like recording and reporting migrants. Some websites that show how individuals can help include http://www.monarchwatch.org/ and http://monarchjointventure.org/ or just Google monarch butterfly. We need to help fill the skies with black and orange.